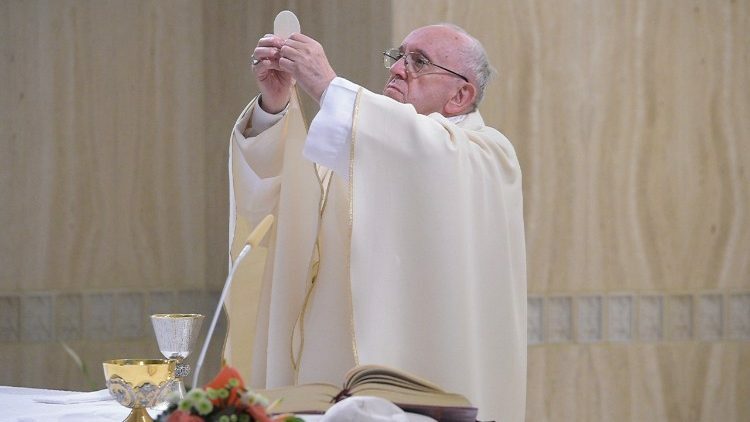 On Monday, Pope Francis resumed the celebration of daily Mass at Casa Santa Marta, commenting on the Gospel of the day saying that “the truth is humble, the truth is silent”. By Sr Bernadette Mary Reis, fsp Pope Francis focused his homily on Monday at Casa Santa Marta on the Gospel of the day from Luke (4:16-30) when Jesus returns to Nazareth and meets opposition in the synagogue after commenting on a passage from the prophet Isaiah. The Pope highlights Jesus’ silent composure not only in this scene but also during the passion. The Pope continued saying the truth is humble and silent and is not noisy, acknowledging that what Jesus did is not easy. However, “the dignity of the Christian is anchored in the power of God”. Even in a family, he said, there are times when division occurs because of “discussions on politics, sports, money”. Pope Francis recommends silence and prayer in these cases: With people lacking good will, with people who only seek scandal, who seek only division, who seek only destruction, even within the family: silence, prayer.